Depending on where you are located, you may still be in summer mode or you may be knee deep in back to school tasks! 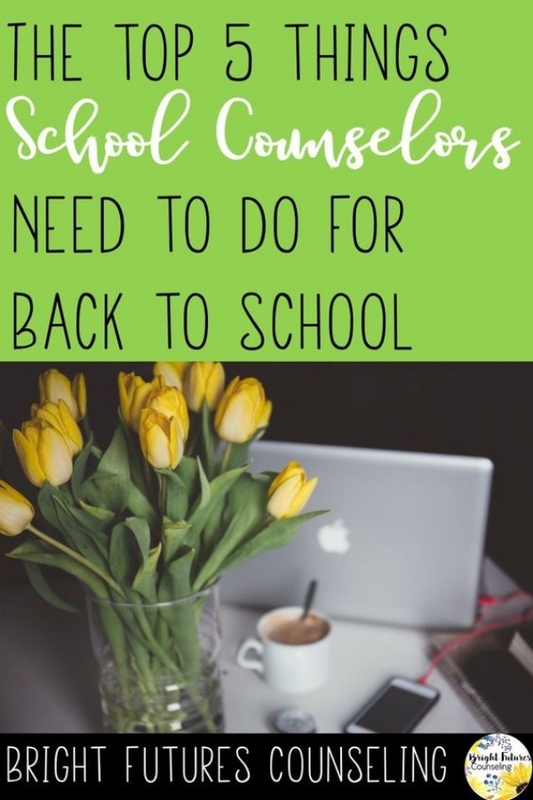 Whether you are a first year school counselor or a seasoned veteran here are a few essential tasks that help for a smooth start to the school year. In my experience working at the elementary level I was never assigned a caseload but rather formed my own based on admin, teacher, and parent referrals. Forming your caseload can be challenging as you need to plan for your school year, but typically no one is referring students the first week of school. There is a fine line between making sure you are reaching out to kiddos in need and treating counseling as a recruitment process! Here are a few tips for making sure no one slips through the cracks. - Take a look at the students you met with last year. Send home a proactive letter to parents welcoming them back to the school year and attach a referral form (snag mine here!) and permission slip. This way they can continue counseling for their child right away if they wish, or they can keep the paperwork on hand in case they decide to later in the year. For parents to already have a referral form and permission slip in advance is a huge time saver. My process was always to give the student's teacher the forms to send home in their backpack aka the black hole. It would sometimes be a week before I received permission slips which delayed the counseling process when I had a student in need of services. The student may not even need counseling this school year but you'll have a permission slip on file for a quicker turnaround time if they do. - Email teachers with potential concerns. Again looking at my list of students from last year, I send teachers a quick email with a list of student names for them to keep an eye on. Hopefully, continued counseling isn't necessary for every student but again it is always good to be a step ahead so no one is overlooked. - If you're a new counselor, reach out to your administrator or previous counselor, if available, to see which students may need group or individual counseling. Don't stress if you aren't seeing a ton of students consistently the first few weeks. This is a good thing! The referrals will come, believe me. - Make it fun! Using a game or activity is a fun way for students to see that you are helpful and easy to talk to, not intimidating and scary. Check out my Meet the Counselor Game Show and Mission: Meet the Counselor for highly interactive activities. - Creating a group or lesson for new students is a great way to explain your role and allow them an opportunity to meet new friends! - Don't forget to introduce yourself to staff too. Ask you admin if you can have a few minutes at the first staff meeting to explain your role and plans for upcoming groups and guidance lessons. - Parent introductions are super important as well. Create a brochure for Back to School Night to pass out and explain your role. Oftentimes parents are unsure what the school counselor does, or they may think that counseling is only for "problem kids." Be sure to explain the proactive, preventative tier 1 resources that are available to all students. Find out what curriculum your school uses or create your own! Even if you are already familiar with your school's curriculum go ahead and schedule these lessons in advance. My first year I made the mistake of emailing teachers every month asking for their ideal time for me to come in. They were already getting a ton of emails and keep a fairly consistent schedule so the following year I decided to email them once at the beginning of the year and then send reoccurring calendar invites for the entire school year. They liked this method a lot better! It was predictable and on both of our Google Calendars. - If your school doesn't have a set curriculum send out a Google Form Needs Assessment to get teacher input on hot topics for future lessons. I do a combination of structured curriculum based lessons along with as-needed lessons by teacher request. The beginning of the school year is typically pretty slow, so take advantage of that time to prep, prep, prep! Print, laminate, staple, and file! Now is the time for you to have everything organized and easily accessible so when you have a line at the door in a month or so you will be prepared. While decor is not a top priority, it is necessary. And c'mon you know you've been dying to do it since you saw those Pinterest ideas in June! Investing in a few items to make your office a welcoming, safe space goes a long way. Kids are coming from all kinds of home environments, many which are ever changing and uncomfortable. Creating a cozy office helps students feel comfortable which aids in the rapport building process. Having a few sensory items and a calm-down corner can remind students that all emotions are okay and that you are here to help. Check out this post on how to make your school counseling office hygge.